In 2010, Grupo Guaycura opened its first restaurant in the pueblo mágico, Todos Santos. “El Jardin” restaurant is in the courtyard of the Guaycura Boutique Hotel, which sits between the palm oasis, the Sierra de la Laguna mountains, and the Pacific Ocean. 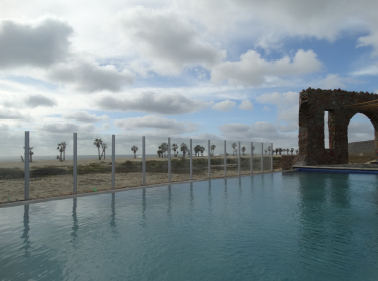 The matchless blend of the hotel’s location with Todos Santos’ near-perfect climate is reflected in “El Jardin” restaurant’s superb blending of Mexican cuisine with a Mediterranean influence. Guests experience the quality service characteristic of the Guaycura, coupled with the freshest ingredients available. 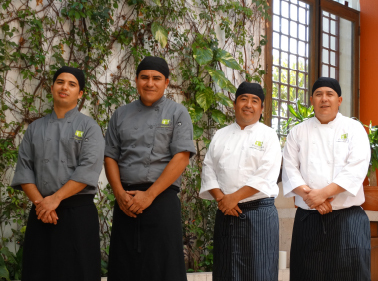 Most produce—organic whenever possible—is grown locally, and the chefs proudly adapt traditional recipes using seasonal fruits and vegetables grown in the Guaycura’s own garden. 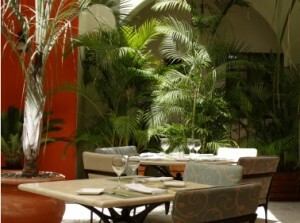 “El Jardin” restaurant, set in the beautiful garden courtyard, is both intimate and elegant. In the morning, breakfast is served at the eight patio tables and in the evening, the courtyard is transformed to hold four chef’s tables, each with fine linens and candlelight. Clientele and guests can feast on top-quality meat dishes and fresh seafood chosen from the nightly “author’s cuisine” menu, featuring dishes that incorporate textures, aromas, and flavor combinations to stimulate the senses and please the palate. Breakfast, served 7 to 11 am: Continental, American, and a la carte with a variety of choices. Intimate Fine Dining, 6 to 9 pm: Different specials offered each evening on the “author’s cuisine” menu, showcasing the chef’s creativity. These dishes are based on classical Mediterranean-style cuisine, with a touch of Mexican flavor. Also on the menu are some traditional Mexican dishes. The wine list includes wines produced in Baja California, Chile, Argentina, California, Spain, and France. Dinner reservations suggested. AMEX, Mastercard, Visa accepted. 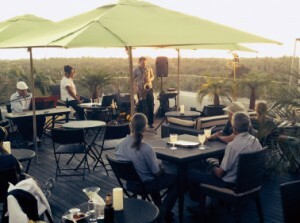 A few months after opening “El Jardin” restaurant, the third floor terrace of the Guaycura Boutique Hotel was opened as the “Sky Lounge” Tapas Bar. The terrace lounge gives visitors the opportunity to enjoy stunning sunsets over the Pacific Ocean and moonrises over the Sierras, as well as spectacular views of the palm oasis. Visitors to the “Sky Lounge” can sit back in comfort with an ice cold cocktail or glass of wine, while enjoying light background music. It all combines to create a casual, relaxed experience. On weekend evenings, the lounge has live jazz music; the perfect accompaniment to sipping a nice glass of wine and sampling delicious morsels from the tapas and Mexican appetizer menu. Try the pincho de pollo con jamón serrano, chicken cubes and serrano ham, with mashed potatoes and honey sauce with chipotle or the bacon wrapped shrimp with goat cheese and peppers. 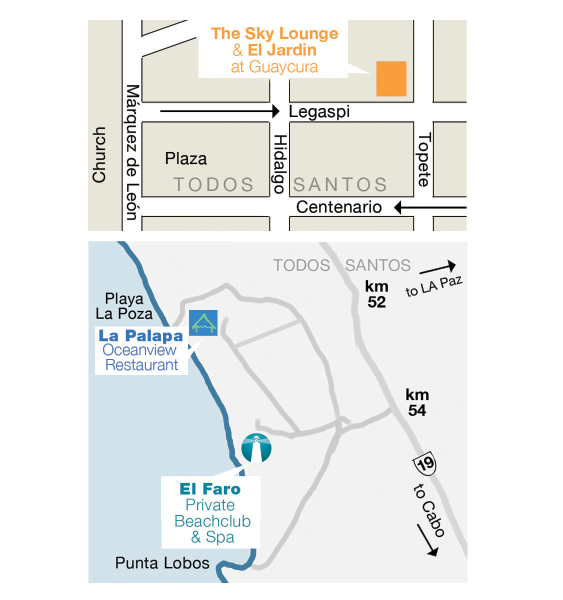 The “Sky Lounge” Tapas Bar is open from 5 to 10 pm daily, serving traditional Spanish tapas and Mexican appetizers until 9 pm. Full bar. Baja California, Chilean, Argentinian, Californian, Spanish and French wines. AMEX, Mastercard, Visa accepted. With its panoramic views of the Pacific Ocean and the Sierra de La Laguna mountains, the soon-to-be-opened restaurant at the palapa promises to offer an unforgettable experience in Mexican alta cocina that is known for its exquisite flavors. Visitors will be able enjoy an exceptional view while savoring excellent seafood freshly caught by local fishermen, choice cuts of steak, or organic chicken. Lighter meals, such as appetizers, soups, and salads will also be available. And, of course, there will be delectable desserts. This magnificent setting is also perfect for social events and weddings. The lunch and appetizer menu includes: Seafood, gazpacho, and tortilla soups; salads; house seafood specialties, including fresh fish and octopus; organic chicken and beef entrees; ice cream, and a variety of dessert choices. Full bar. The wine list includes wines produced in Baja California, Chile, Argentina, California, Spain, and France. 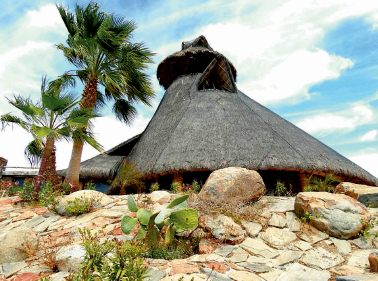 “La Palapa” Ocean View restaurant is open daily from 12 pm until sunset. AMEX, Mastercard, Visa accepted. The newest offering from Grupo Guaycura is “El Faro” restaurant at the “El Faro” Private Beach Club and Spa. Capturing a casual luxury lifestyle that emphasizes health and sustainability, El Faro restaurant serves an exquisite fresh seafood menu in an atmosphere of elegant relaxation on Todos Santos’ southwest beach. Guests will enjoy a menu of seafood cocktails, ceviches, tacos, empanadas, sashimi, and “surf and turf” a la parrilla combinations. The wine list includes wines produced in Baja California, Chile, Argentina, California, Spain, and France. “El Faro” Private Beach Club and Spa is open daily from 11 am until sunset. The new administration under the leadership of Carlos Arnaus, seeks to maintain a close relationship with the community and ensure high quality, personalized service, by assembling a talented professional staff to make your gastronomic experience a pleasure. In 2013, The Guaycura Boutique Hotel was rated 5th in the “Top 25 Small Hotels in Mexico” by Trip Advisor. “El Jardin” Restaurant and the “Sky Lounge” Tapas Bar are located in the Guaycura Boutique Hotel on the corner of Legaspi and Topete, near the Todos Santos plaza. “El Faro” Private Beach Club & Spa and “La Palapa” Ocean View Restaurant are located off the old “Punta Lobos” road; km 54 on the highway from Cabo San Lucas to Todos Santos.